Make-do Mum: The hard work pays off. The hard work pays off. All of a sudden we can eat from the garden every day. And sometimes all of our veges for a particular meal are from the garden. It feels amazing. 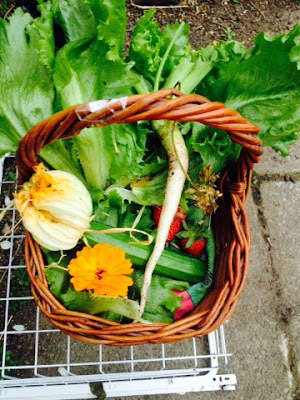 White carrot, courgette, calendula, lettuce, strawberries. Our rather large raspberry bushes turned out not to be raspberries. But boysenberries are equally welcome!!! It has long been a dream of mine to harvest enough garlic to create a garlic plait. 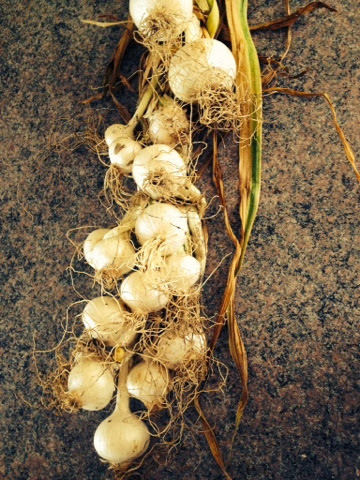 On harvesting the garlic, which was an unnamed variety from Commonsense Organics I learnt that it is Pearl Garlic. I think I'll search out a different variety next year as I will get through the Pearl Garlic quickly (it is just one large bulb). The garden does requite a fair amount of attention at the moment, but it is worth it. The deep freezer is full of frozen herb pestos, homemade cordials and soon it should be full of frozen beans and courgette as well. So sweet. 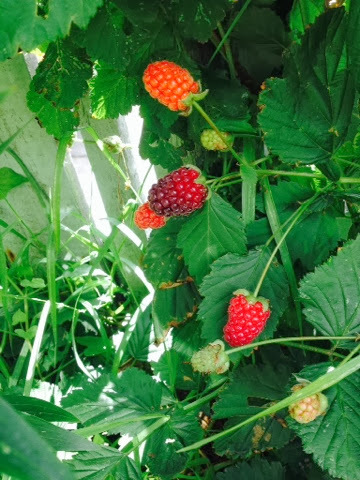 Each year I garden it becomes more cost-effective (particularly with the berries and fruit trees). I'm off to create a lovely picnic dinner of garden salad, white carrot, calendula, cucumber (I bought this but should have my own in a fortnight) and parsley pesto roast chicken. I'm really enjoying this year's Christmas parties!